Week two is in the bag! Week one was tons of fun, and also tons of WORK. Two different works of Joan Tower made for some epic rehearsal schedules. This week was a bit quieter – for me – because I didn’t play every work on the program this time. Rare for a violist! It was also a bittersweet time after our final concert of the weekend, because it marked the wrap for Greg Ewer’s stint at this year’s festival, and also the end of our time at J. Christopher Wines’ wonderful barrel room. I brought five bottles of wine home over the two weeks, so at the very least I’ll have those to savor as I remember the fun times spent there. Violinists Megumi Stohs Lewis and Sasha Callahan gave a virtuosic performance of Prokofiev’s truly epic Sonata for Two Violins. It’s one of those rare duo pieces that gives the impression of more than two instruments. It also has no ‘dead’ spots where you can sense that the composer is filling time before the next good idea. It’s first rate Prokofiev. Sasha, Greg Ewer, myself, and Leo Eguchi were next joined by violist and composer Kenji Bunch for a rollicking performance of his string quintet String Circle. As Leo noted in his introductory remarks on the program, it’s a immensely approachable piece that also has real compositional meat and depth. The central slow movement, based upon the folk tune Wayfaring Stranger, was written partially in response to the death of Johnny Cash, whom Kenji admired as a person and as a musician. Loads of fun to play, and based upon the responses of our audiences, loads of fun to listen to as well. The last piece on the program was the lone known string quartet by Fanny Mendelssohn Hensel. It’s been played more and more in the past few years, not least because of the wonderful recording by the French quartet Quatour Ebéne. It’s a quartet that is slowly entering the repertoire – and given that Ms. Hensel wrote over 400 pieces of music – there are surely more hidden gems awaiting our discovery! In any event, it was a thrilling piece to play, with the virtuosic leadership of Greg Ewer on first violin – he has a virtual concerto to play in the finale – and as always, making music with Sasha and Leo was meaningful and a total blast! Charles Noble, Sasha Callahan, Greg Ewer, Kenji Bunch, Leo Eguchi, and Eve Callahan after the concert in J. Christopher’s fantastic barrel room. After a well-deserved day off, the musicians of the festival are back this morning for the first rehearsal of week two. What’s on tap for this weekend? Some really tasty music, that’s what! Works for two instruments are some of the hardest pieces to write effectively. There’s no much time for either instrument to rest, first of all, since the piece is called a duo, and not a solo. Additionally, finding contrast of textures with two like instruments can also be a challenge. 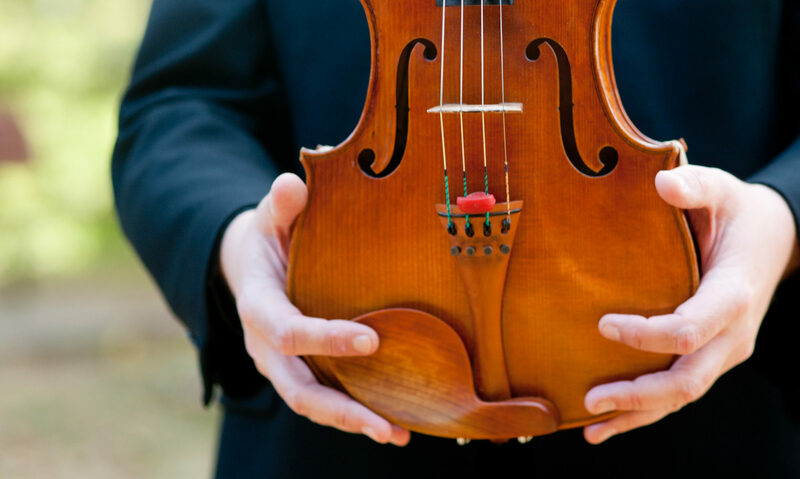 There are a handful of pieces for two instruments that I think are masterpieces, including Ravel’s Duo for Violin and Cello, Martinu’s Two Madrigals for Violin and Viola, and the piece on this week’s program, Prokofiev’s Sonata for Two Violins. Violist-composer Kenji Bunch returns to the festival to perform in his string quintet String Circles. It’s a reimagining of the traditional string quintet, but instead of using classical Western music as a basis, it plumbs the music of Americana instead. There’s funk and bluegrass in the mix, and it’s delightful! Fanny Mendelssohn-Hensel wrote a string quartet. Did you know that? Did you also know that it’s a really good piece of music? Yep. It is. It’s a major four movement piece that uses the string quartet instrumentation to great effect, and it’s a piece that should be in the standard repertoire. Thanks to a recording by the fantastic Quatour Ebéne, it has gotten greater exposure, which is well-deserved. You may have heard local quartet Mousai REMIX play it a few seasons ago – it’s worth another listen, so come on out and hear us play it, and the other works on this program, at J. Christopher Wines on Saturday and Sunday, August 18-19. Tickets are available here. One of the barrel caves at J. Christopher Wines in Newberg, Oregon. What a week it’s been! Five intense days of rehearsal, four fantastic pieces of music, and six musicians who not only play well together, but like each other as friends, too. It’s magic, really, this festival. One of the highlights for me was getting to work with the distinguished composer Joan Tower, whose works were featured this past weekend. She is remarkable. Sharp, witty, and ever so slightly irreverent (both of herself and her music), she put us at immediate ease when we played through her pieces for her. They are not easy – and put us to the test – much as Beethoven does in his great string quartets. Tower described her works as having “motives of intention”, which is a perfect description for how Beethoven constructed his greatest works. The program, which was constructed by the husband and wife artistic team of Sasha Callahan and Leo Eguchi, was very deftly assembled. Haydn – who essentially invented the string quartet form as we have come to know it – was represented by his Op. 33 no 2 quartet “The Joke”. It has all manner of witty asides – some of which are obvious, like the false endings that conclude the piece – and some which are meant for the musicians alone, with strange glissandi, unusual voicing, and the like. As Joan mentioned in her remarks, Haydn took risks as a composer. In this quartet (as in many of his others), he stops time and challenges the audience by using their own expectations to confound them. True genius. On Saturday’s concert, the piece of Joan’s that was featured was her Rising, for flute and string quartet, written in 2009 for flutist Carol Wincenc and the Juilliard Quartet. We in the quartet (Megumi Stohs Lewis, Sasha Callahan, myself, and Leo Eguchi) were joined by Portland flutist Amelia Lukas. In the warm and enveloping acoustic of the J. Christopher Wines barrel room, the sound of the flute soared at any dynamic, supported by the bristling carpet of string figurations that are characteristic of Tower’s writing. On Sunday’s concert, Sasha, Leo, and I were joined by violinist Greg Ewer for Tower’s Fifth String Quartet, White Water. I adore this piece, and not just because it starts with a viola solo in its most plangent register. It is, as some jazz musicians say, a tight piece. There are no extraneous gestures in the 17 minute quartet – which is in one continuous, flowing movement – and it makes great demands upon the players, all of which are made gratifying by the musical content (which cannot always be said about some pieces of music, whose content can be sparse, but the musical demands horrific). Barrel room at J. Christopher Wines. The concluding piece both days was Beethoven’s Op. 59 no 2 Rasumovsky quartet. This 40-plus minute piece is the height of his middle period quartet writing. As a performer, one of my favorite games to play is seeing trends in a composer’s work and following where they go as the composer continues their writing in the genre. For example, the first movement of the quartet has some of Beethoven’s most intricate intertwining writing for the four instruments, which to me foreshadows what he would unleash on the quartet in his epic Op. 130 quartet’s first movement. His grand, unhurried, and serene slow movement (the longest in the piece) foreshadows his sublimely incandescent slow movement from his Op. 132 quartet, his Hymn of Thanksgiving. Interestingly, his scherzo (one of his unique five part scherzo form movements) looks back to Haydn with its misplaced accents and folk material). Finally, the galloping Finale again looks forward to his massive finale to the Op. 131 quartet, with its iterations of the long-short dotted figures that propel the movement from beginning to breathless end. Making that journey from ‘Papa’ Haydn to Joan Tower to Beethoven made me think of the remarkable progress that the string quartet has made in those nearly 250 years, and of its incredible flexibility in the hands of composers who wish to make the full use of the ‘simple’ complement of two violas, and viola, and a cello. What a miracle the quartet is! The materials can change, but the essentials are this: four musical equals making conversation together. Sometimes there are arguments, even downright fisticuffs. Other times there are moments of great tenderness, the un-burdening of one’s deepest fears, loves, and hopes. And yet other times there are jokes, pranks, japes, and jests – all manner of silliness. That is life, and that is what the great works for the string quartet encompass. And that is why I love them so.